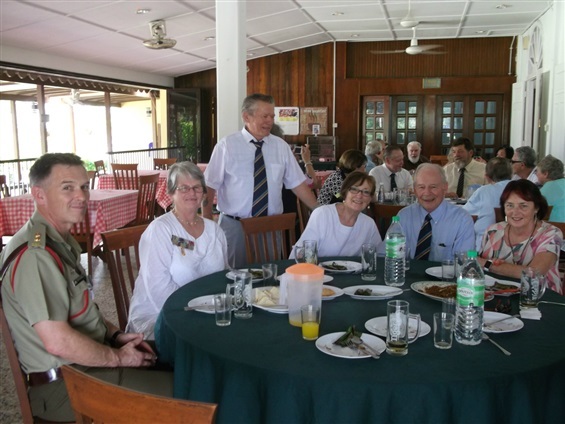 The National Malaya & Borneo Veterans Association (Inc States) has recently returned from its annual Pilgrimage to Ipoh. 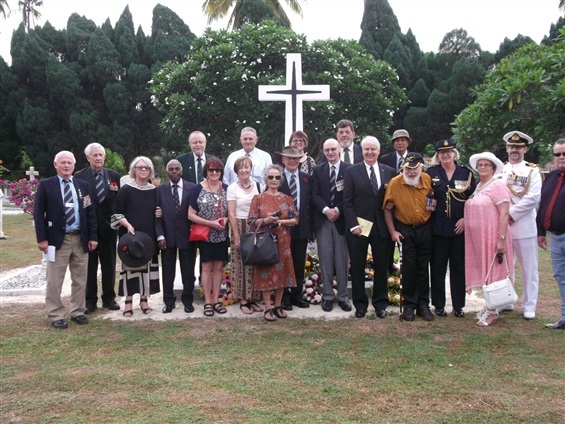 The first item on the Agenda was to pay tribute to the 28 Australian Diggers who lie in the Kamunting Rd Christian Cemetery at Taiping. 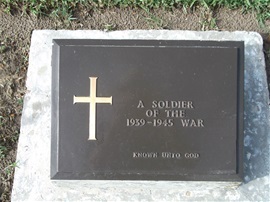 These lads were Killed in Action, Died from Wounds, or Died by Accident from 1956 through to 1961....these were the Emergency years which affected the Australian Army the most, but of course it has to be remembered there are also over 100 British servicemen also interred at Kamunting Rd. Taiping. On the return from Taiping, we called in on the Monument & Gallery at Sungai Siput (N) which is erected on the very spot where Mr Wally Walker and his Assistant, Ian Christian, were murdered on the 16th of June, 1948. This act of thuggery triggered "the Emergency". The Gallery does not have general public accessibility and permission must be obtained from the owners of the Palm Oil Mill located close by. Many people donated the RM100,000.00 required to get the Gallery commissioned, (started in 2010), so it is a very great disappointment to see that the public cannot get to it without quite a lot of prior administration. On Saturday 10th of June, the church service at Holy Trinity Batu Gaja began on time at 0730 hrs. 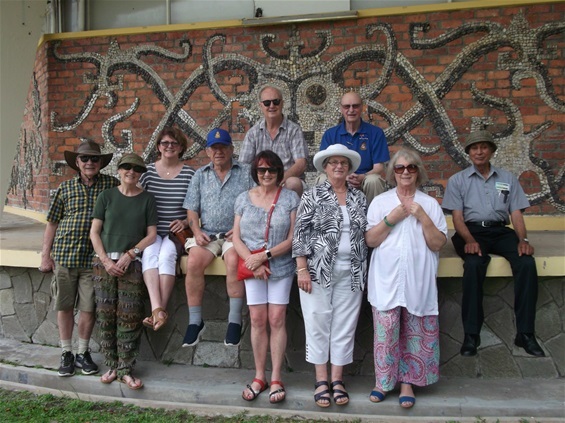 Afterwards, the congregation walked down into what is commonly known as "God's Little Acre" for a Wreath Laying Service conducted by the Malaysian Palm Oil Planters Association. This service attracts the Malaysian Police Assistant Commissioner and a Guard Unit ...who were very keen to be photographed later on with the Veterans in our midst. 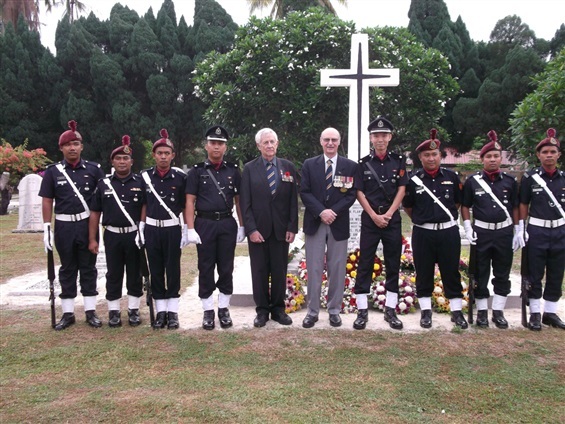 A total of 35 floral tributes were laid during the service, including those from the High Commissions of Australia, Britain and New Zealand. After this service, we took Morning Tea at the nearby Kinta Golf Club, before dashing across town for the 1100hrs service at Camp Sued Putra. It is on this base occupied by No 2 Ranger Bat, that a Gurkha cemetery exists and it contains 29 Gurkha soldiers who were killed in action during the Emergency. It is important to note there is little chance of being sun affected during these activities, as the Malaysians go to a lot of trouble to ensure we are comfortable. 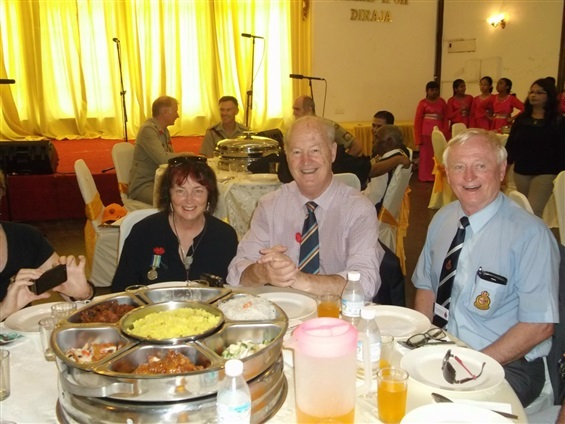 The Planters Association conduct a Luncheon at the Royal Ipoh Club after these events....there is no likelihood of the supply of drinks drying up on this occasion either. In the evening we were invited to attend a "Troops Night" to round off the Commemorative Program in Ipoh for 2017. Sandakan internee Cpt Matthews and his men build a radio during 1944. They were taken from Sandakan to Kuching for trial by the Japanese, ...not a fair trial of course, and all of them lost their lives. Of Cpt Matthews, the POW Camp Commandant Col Suga was heard to say, "He was the bravest man I have ever met". The POW site is now a successful Teacher Training College, but they have retained a Museum area on the site o where Col Suga's house was located. Also retained, is the base of the Japanese flagpole. 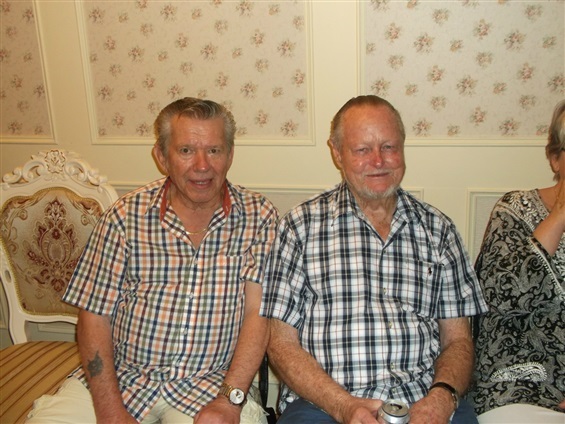 Sylver has crafted two books on the Death Marches, Sandakan - a Conspiracy of Silence, & Blood Brothers.....both excellent reading for those interested in WW2 events. Also whilst in KK, our Association was proud to present a large Atlas to the SANZAC School on Tuesday 20JUN17. We would have purchased it in Malaysia, but after extensive effort, we realised it was not going to happen, so I lugged the extra 5 Kilos all the way....well perhaps not all the way, but it felt like it ! This school was built on land occupied by the Australian Army just after ww2, and a man called Francis Lee (befriended and nurtured by WA Army members.in his earl life) bought the land and offered it as a professional learning establishment in recognition of the excellent start in life he was given by the members of the Australian Army. It is now a Government School, and that is perhaps a little disappointing. The SANZAC school has never forgotten its beginnings however, and we passed a very pleasant morning with some of the staff and senior students. We visited the Labuan War Cemetery on Sunday 18/06/17. This is where the majority of the Sandakan POWs are buried, and sadly, over a thousand of the sites are inscribed as at right "Known unto God". 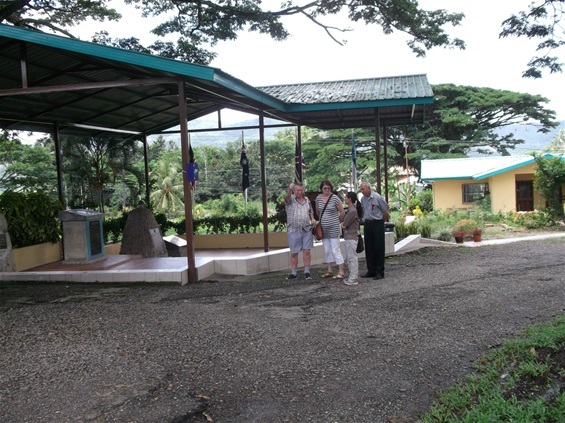 Part of our Borneo group at the site of No 1 POW Camp at Ranau. Note the roofing has been extended in the past few years.